AGI style game made in five days as part of the University of Portsmouth's Game Jam 09. 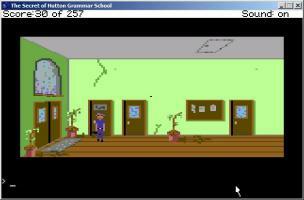 Uncover the secret of an english grammar school. It is up to you, the school janitor, to save the school's students from evil! "A solid, if short adventure game that suffers from a lack of logical verbs and sometimes confusing verbs (items will have one name but the parser won't recognize it). "